But it’s really broader than that. It also includes spending time carefully considering things you may have learned, or things you’re trying to learn. 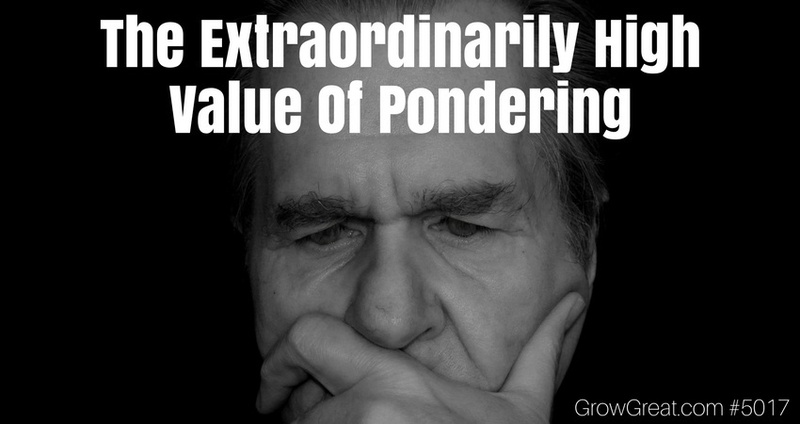 Activating things we’ve learned often requires a certain degree of pondering. It’s not getting any easier. Every business owner, CEO or leader will quickly tell you how busy they are – always pressed for time. The ones who enjoy reading lament how little time they have to do “serious” reading, instead having to be satisfied to scan articles, blog posts, white papers and whatever else crosses their desks. Some people claim “the average CEO” reads as many as 60 books a year, but I certainly see no evidence of that. I know many CEOs who’d tell you they’re lucky to read a handful a year. Still others who declare they hate to read. No matter — business leaders experience a barrage of information and data. Internal and external. Reading and listening. Watching. We all live in a content rich – and content heavy – world. Whether we feel we have time or not, we’re consuming input during almost all waking hours. Something more important is happening here. Learning things like leadership and other business skill requires execution, but first – they need time to take root in our mind. That’s why we so frequently attend seminars and conferences without any lasting results. We hear things – learn things – then go back to work and resume our normal life. Nothing changes. No improvement. No growth. Human beings have a magical ability to make up our minds. That is, we can decide something in a moment. And it can change everything. These are just examples of what I’m talking about. You can make up your mind to be rid of any of these, or all of them. It can happen in a single moment. But getting to that moment is going to require some thoughtful consideration. There are likely things you need to resolve in your own head. Pondering is needed. Devoting time to sober considerations is how we grow to reach these decision points in our life. Then, we put them into action. None of that can happen when we’re busy jumping from content to content, from conference to conference, from seminar to seminar, from book to book – or podcast to podcast. It’s a fascinating merry-go-round we get on. We go round and round looking for the easy button, the fast answer, the quick solution. The addictive nature of acquiring information fosters a growing desire to get more. And more. Hopeful that somebody, somewhere will have just the thing we need to make it all come together. It’s our fantasy. Or a lie told by marketers. Right now, without much thought, you can likely identify a couple of things you wish you’d already incorporated into your life as a business owner or leader. Go ahead. Take a moment and jot them down. Do it right now. If you’re driving or doing something where that’s not possible, then open up a recording or voice memo app on your phone and record them. STOP. Hit the pause button your information consumption. Give yourself some time to consider what you want to improve. Knowing isn’t likely the problem. You already know what to do. Doing is the problem. You’ve not yet made up your mind to incorporate it into your life. Sit down. Take a few deep breaths and figure out how to make it happen in your life. Learn. Do. Make that your new habit.